Lost 25 lbs in my 50's! Healthier Skin even in Cold Winter Months! Lost 20 pounds; Better ENERGY and Hip is Feeling MUCH Better! Carpal Tunnel Syndrome, Shoulder and Hip Feeling Better; Lost 23 more Pounds! "Vim & Vigor’s® Collagenate® has been extremely good for both my joints and weight loss.I have worked for the Post Office for 30 years, which has required a lot of lifting and physical work. I suffered from carpal tunnel syndrome and I had also injured my shoulder, so I was having difficulty at work.I was also having a lot of trouble sleeping, due to not being able to lie on my shoulder. Within weeks of starting Collagenate, I was sleeping fine on my shoulder and was back to being able to use my hands and arms at work with no pain! I had a hip replacement years ago, but was still experiencing pain where the prosthesis was in my leg. Since Collagenate, the pain is gone and I am now able to run! 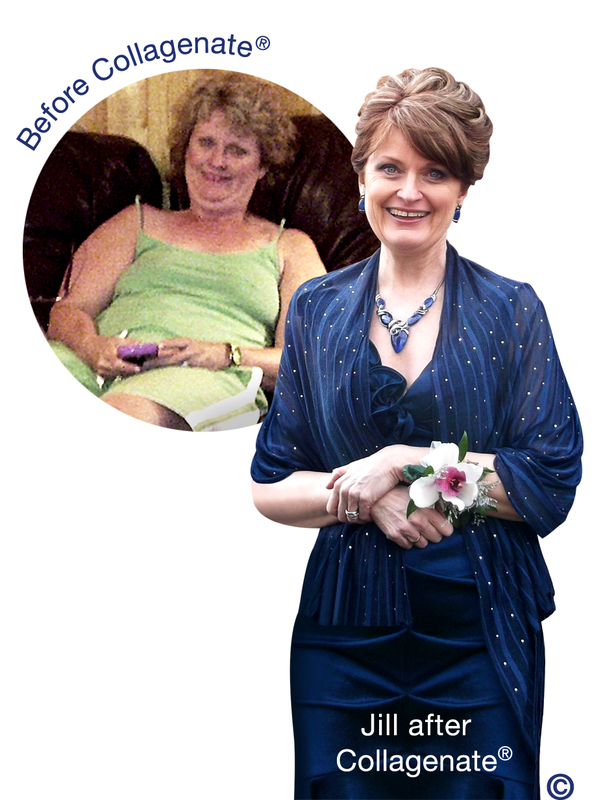 I am 58 years old and was looking for an alternative to medication and surgery; Collagenate has been the answer for me! I am now able to do things that I wasn’t even able to do when I was younger! Tried Everything, but Nothing worked until Collagenate® & CitriCare®! 17 yr old - Lost 80 lbs on Collagenate®; Improved Self Esteem! Lost 30 lbs; Looking & Feeling Younger! My whole family lost weight and my cholesterol improved! Don't let unwanted fat or achy joints hinder your lifestyle! Stopped my Arthritis Medication! Catch me if You Can! Arthritis & Fibromyalgia, but I'm Back Dancing! Two Back Surgeries; then Collagenate helped tremendously! Younger looking Skin! Diabetes & High Blood Pressure; Doctor said Collagenate was OK to take! Can Now Enjoy my Grand-kids with NO Pain! 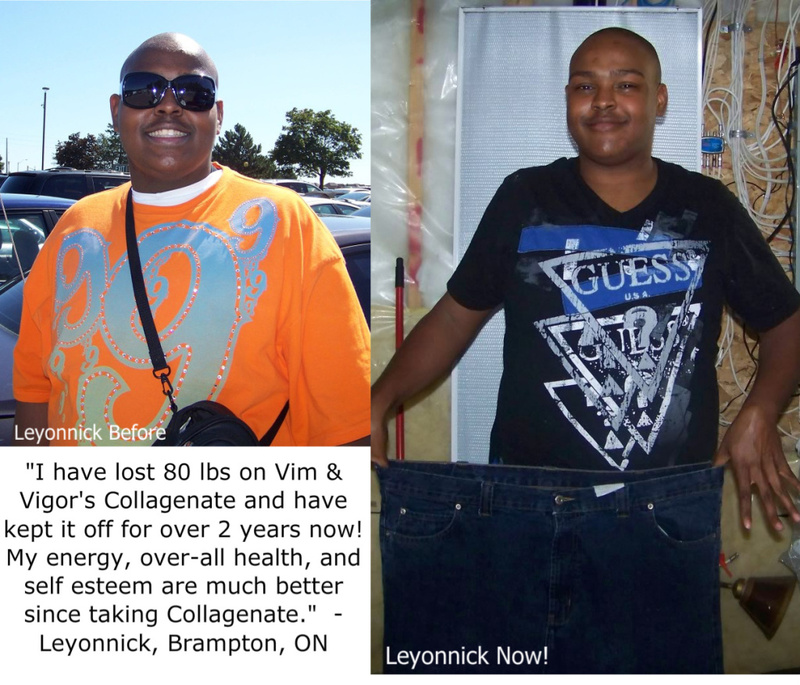 "I'm getting such great results with Vim & Vigor's Collagenate; I can't believe that I put it off for over a year before finally giving Collagenate a try!I was in a car accident years ago and had bad pain in my shoulder, which made it hard to sleep.I was told that I would probably need surgery.I also had pain in my knee from a cracked knee cap and arthritis.In less than 3 weeks on Collagenate, the pain in my shoulder is gone, I’m sleeping well through the night, I have more energy throughout the day and I have more flexibility and strength in my knee. Lost inches in my waist; hair and nails thicker and healthier! Lost Weight in Waist & Stomach; Improvements in Knee and Skin! Lost 32 pounds and knees are feeling much better! Click Here for more info on what Collagenate (sounds like: Collagen8) is and how it works! Lost 40 pounds and everyone is noticing! Lost 12 pounds, even with a low thyroid! Lost 25 pounds and No more pain in my Joints! "I am getting such good results with Vim & Vigor's® Collagenate® that I can't decide with which it is helping me more, my joints or weight loss! I've lost 25 pounds since starting CollagenateÂ® and it is helping my knees tremendously. I have tried every joint supplement that you can imagine and am happy to say that Vim & Vigor's Collagenate® is the first thing that really worked! The absence of pain in my joints is heaven!" 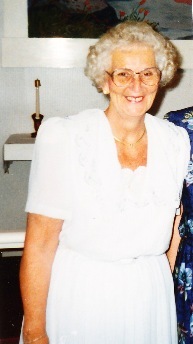 * - Pat M.
"Lost 58 pounds; my joints and overall health are much better!" My diabetes and blood pressure has improved and I feel great! Less Belly Fat and Cellulite is Disappearing! Out of 'Diabetic Danger Zone'! “I am really pleased with Vim & Vigor’s® Collagenate®! I listened to the advertisement for some time before I finally ordered. I was skeptical because I had taken other products that did not do what their ads said they would do. But I have to say that for me, Collagenate has done exactly (or even more than) what Karla, the “Vim” of Vim & Vigor said it would do. I got it to help me lose some belly fat, which has accumulated as I have gotten older. I was diagnosed the previous year as a Type II Diabetic, and as such the belly area really becomes a tough place to lose. Within the first few weeks with Collagenate, I noticed inches lost and firming in that belly area! But what really impressed me was the improvement in my sugar levels! It’s been less than two months and I am now out of the ‘diabetic danger zone’ and I do not have to prick myself six times a day anymore. I used to get profuse hot sweats several times a day when my blood sugar levels peaked, but I am not having those sweats anymore! "I have been taking Vim & Vigor's® Collagenate® for 3 months now and it is doing wonders for my Fibromyalgia (an arthritis of the muscle). My pain has decreased tremendously and I can now do the things that I used to take for granted. I can clean the house, cook, go up and down the stairs; it's wonderful! I feel like my young self again! I have also lost a lot of inches and my clothes are fitting much better. I love CollagenateÂ® and am so glad that I responded to the ad that I heard on the radio!" * - Bev E.
Coping Better with Fibromyalgia & Lupus! "Vim & Vigor's® Collagenate® has really turned my life around. When I started Collagenate®, I was suffering from Fibromyalgia and SLE Lupus and was experiencing a lot of pain. Amazingly, within a few weeks on Collagenate® I noticed considerable improvement. The pain from the Fibromyalgia as well as the achiness from the Lupus was greatly decreased! I am also going through the "change in life" and Collagenate® has really helped in taking the bloat away and the excess bulginess in my waist. I am not very overweight; however, as I have gotten older my waist has been accumulating an extra bulge. I am pleased that Collagenate® has especially helped with the inch loss in my waist! Thank you Vim & Vigor!" * - Karen B. Suffered for years with Fibromyalgia pain, Finally Found Something That WORKS! Click Here for more info on what Collagenate is and how it works! Shed Unwanted Fat and Got Very Lean! Personal Trainer Sold on benefits of Collagenate®! "I've been a personal trainer & fitness pro for over 20 years. I’ve never endorsed or recommended anything in the past, but I am totally sold on the benefits of Vim & Vigor’s Collagenate®. It’s all natural.It has improvedmy hair, my skin, my sleep and my ability to lose weight.My energy level is back like it was when I was 20 and my recovery time has improved! I feel great and have been told I look great, too! At 40, I had started to have digestive problems and now they're gone. I am totally sold on Collagenate and am now recommending it! "* - Judith D.
Fitness Instructor Gets Leaner Body and Stronger Knees! Tried Two Other 'Collagen' Supplements that did not work; Collagenate® DOES! Less Wrinkles with Collagenate, due to more Collagen in the Skin! Skin is Vibrant, Hair is Shiny & Healthy Looking, Nails are Growing, Better Energy...! Hot Flashes gone; Sleeping through the night! Lost 43 pounds and Blood Pressure Improved! Lost 26 lbs, have Smoother Skin, and Still Riding my Horse at 81 years old! "I broke a disk in my neck in an auto accident and my doctor said I would have migraine headaches for the rest of my life. He was right for seven years, until I found Collagenate®! Collagenate® has given me a new lease on life. My migraines gone, I have lost 20 pounds in two months, and have gone from a size 16 down to a size 12. I recommend Collagenate® to all of my friends. Thank you Vim & Vigor®! "* - Dorothy J., Detroit, MI. Lost 100 lbs and have kept it off for over a year! Lower Cholesterol and Better Knees! *The information on this website is for your education. Nutritional supplements can help to nourish and support the body. Collagenate is NOT a drug and therefore the statements have not been evaluated by the Food and Drug Administration. Our products are not intended to diagnose, treat, cure or prevent any disease. Testimonials are from customers and represent their personal opinions. Results and experiences may vary. Not recommended if pregnant or breast-feeding, or for prepubescent children. Vim & Vigor® (818) 880-5119 or 1-800-622-thin (1-800-622-8446) © Vim & Vigor, Inc.